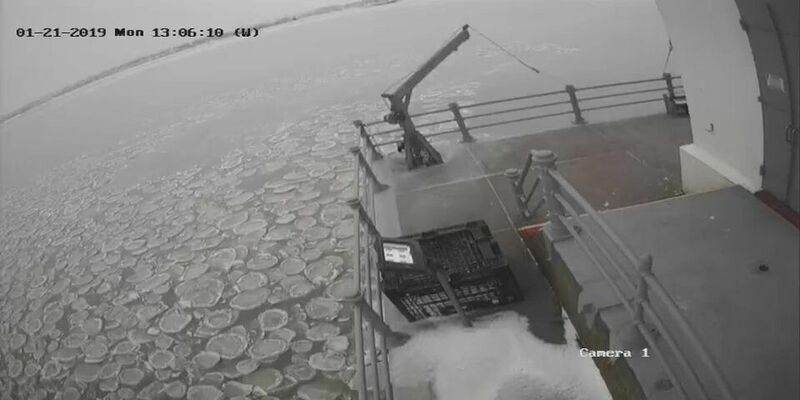 Ice "pancakes" have formed on Lake Erie surrounding the Lorain Lighthouse. CLEVELAND, OH (WOIO) -The arctic air that has chill blasted Northeast Ohio has brought with it some natural wonders in the form of ice “pancakes” and even an ice disk. The Lorain Lighthouse posted pictures on Monday of what looks like pancakes, or even a frozen jelly fish invasion, on Lake Erie. According to Cleveland 19 Meteorologist Jeff Tanchak, this happens when ice chunks start to form, get blown by the arctic wind and bump into each other. In the case of the Rocky River ice disk, it’s more about the flow of the river which is causing a piece of ice to spin and get bigger. The ice disk can be spotted (before it completely freezes over or melts) in the Rocky River Reservation in Rocky River. It can be seen from the Valley Parkway bridge just north of the Memorial Field.